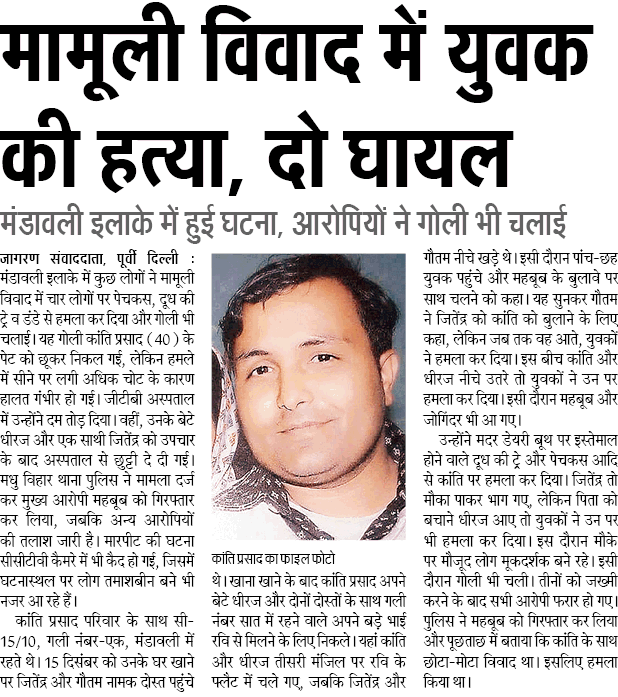 A shocking murder of a 40-year-old man in East Delhi’s Mandawali area on Friday evening has been caught on CCTV. The deceased man, Kanti Prasad, his son Dhiraj and a friend Jitender were beaten with wooden sticks & a milk tray and stabbed to death with a screwdriver by a mob led by his neighbour Mehboob Ali, in a street near his home. One of the assailants also fired from a pistol at the victim. CCTV footage shows the two victims being dragged, brutally thrashed and stabbed by men. The victims cried for help but passers-by did not intervene due to fear for their own lives. Initially the mob was attacking Kanti Prasad, but when his son tried to stop the assault, they attacked him too. The brutally injured 40-year-old Kanti was rushed to hospital later but he succumbed. His son and friend also received treatment for their injuries. The prime suspect Mehboob Ali and one other person have been arrested but around a dozen other members of the mob are on the run. Many media outlets like Times Now, Jansatta (Indian Express group) have reported that the murder took place on Saturday evening, but the CCTV footage of the crime shows the date as Friday, 15 Dec 2017 and time as 10.30 PM. There is also lot of discrepancy about the deceased’s age, with his age being reported anywhere between 32-40 years. Jagran has reported that Kanti’s friends Jitender and Gautam had come to his house for dinner on the night of 15 Dec. After dinner, the three along with Kanti’s son Dhiraj went to Kanti’s elder brother Ravi’s house. Kanti and Dhiraj went up to Ravi’s house, while Jitender and Gautam stood below. Some youth came and asked for Kanti, saying that Mehboob had called for him. As soon as Kanti came down, the mob started beating him up. Mehboob also arrived and used a tray kept at a nearby Mother Dairy booth and a screw-driver to assault Kanti. When Dhiraj tried to intervene to save his father, he too was assaulted. The mob threatened bystanders from coming to Kanti’s aid. Afterwards, they all fled. Police has arrested Mehboob Ali and are saying the attack on Kanti was a result of some “minor dispute” between the two. This murder will soon be forgotten as the identity of the victim and accused do not make for good political theatre for our left-liberals who control national media. How many people remember that dentist Pankaj Narang was killed in similar brutal fashion by a Muslim mob last year in West Delhi’s Vikaspuri? Or 14-year old Yogesh Kumar, son of an ailing domestic worker mother, who his mother alleged was kidnapped, tortured and lynched to death by his Muslim friends? 5 days after the murder, our national media is still not sure about Kanti Prasad’s age, the exact date and time of his murder, or the motive for the murder. The police version of a ‘minor dispute’ has also been taken at face value. There is no investigative journalism or interviews of the victim’s family, bystanders etc. to dig deeper into the matter like we saw in Mohammed Akhlak or Junaid Khan cases. Congress, Marxist, and secular leaders are not making a beeline to the victim’s house, raising concerns over the law & order situation or announcing compensation packages. Even the national leaders of the ‘Hindu nationalist’ BJP will avoid this case, as their stated focus is on ‘vikas’ (development) alone. The Truth Is Under Siege – Will You Protect It?